ism, increased productivity, lower health care costs and better work performance. You can get your employees wearing your brand all the time when you incent them for long periods by developing an exercise calendar. You can keep the excitement alive for your ﬁtness programs by connecting your promotion to special days, weeks and months. For example, National Yoga Day will keep your ﬁtness programs in the fore-front of both customers and your employees. Don’t forget drinkware! Everybody carries a waterbottle. Resistance bands, lip balms, hand sanitizers, and a highly important promotional product is the gym bag. Last product recommendation for this article are cooling towels. Its all good to sweat but having a cooling towel is a fast way to cool down...and keep your logo in front of your clients. Hi-tech fabrics, like cooling towels, have similar hi-tech qualities. Self-wicking shirts allow persperation to evaporate...which keeps you cooler during workouts. Now, let’s discuss why its important to plan your promo’s NOW so that they execute in late April or in May. People--especially those in the colder areas of the country--want to get out and shed those extra pounds because Summer is right around the corner. Catching them now will keep them in your promo gear for the entire Summer where you’ll reap more impressions than you do in the Winter months. See the next page for additional product suggestions. Marketing Let’s get on board with this thought: April and May are kick-oﬀ months for the Summer and its really critical for you to ready your upcoming Summer promotions NOW. Waiting to the last moment to order your products has its downside. Remember...you want your logo to look PERFECT on whatever product you’re going to chose for your Summer promotions. Getting the exact proof will make a diﬀererence. Don’t worry, we will always get your job done, but it just makes sense to avoid rush charges and stress. National Humor Month April--Sponsor a Contest for the Best Joke or Humourous Moment. Autism Awareness Day, April 12--You ALWAYS win when your community is involved in helping others. Administrative Professionals Day April 26--A great way to reward those who make a diﬀerence in your company. Earth Day April 22--Score big and make the earth a better and cleaner world. Report This Ad--Great idea because almost everyone will engage and, report your ad. Tax Day April 15--Turn a sad day (for some) into a happy one with a refund-related theme for this promotion. Think Spring!--Many people are burnt out with Winter and want to come out of hibernation. Your promotion could be that push so needed. Lupus Awareness Month May--Being part of mediciallybeneﬁcial promotions always instills people to carry your logo. Blood Pressure Month May--High blood pressue is still a signiﬁcant problem in our society. Nurse’s Week--The ﬁrst full week in May, its a great event to support your local nurses thanking them for their service. Emergency Medical Service Personnel (EMS), is the last week in the month. Mother’s Day--No matter what your Mother’s Day promotions will be a big hit. Armed Forces Day--Win big with ad impressions and support those that give their lives to make our’s free. National School Nurses Day--May 7 recognizes nurses for their quality health care. According to the US Census Millennials are exceeding the Baby Boomer population making them the Nation’s largest generation. Their vast numbers mean we all have to make part of our job to be experts in knowing all about them...their identities, buying habits, really what makes them tick. We’d like to explode one myth about Millennials and that is they are the generation of instant gratiﬁcation and want everything for free. Forget it...that’s past. These kids work really hard and are forming the backbone of America. They really are forging our future. Millennials don’t have to get expensive promotions, rather, they prefer products that work well, are thoughtful, have value and that’s what makes them want to share it with their friends. So if it’s a cool and functional product, you’ve won them over and they will be your Brand Ambassadors! Millennials make incredible Stakeholders in your company...they are loyalists! 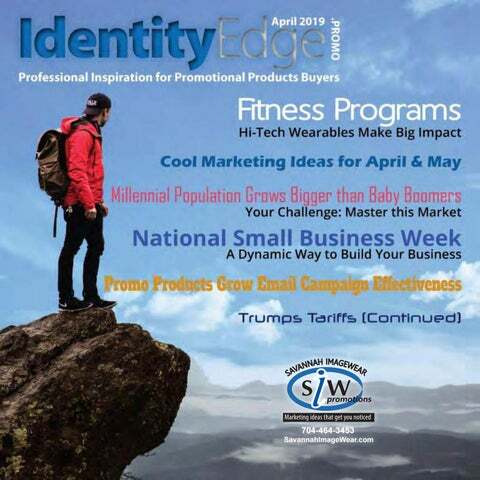 The key is knowing what products ﬁt Millennials and we--your Promotional Products Distributor--have the database to ﬁnd perfectly targeted products. its going to do more damage to your company than good. Millennials won’t carry it and they’ll probably dog it to their friends...just the opposite eﬀect promo products are supposed to have. National That doesn’t make much sense does it? “National Small Business Week...is a time to gain big business” but if you think about it for a moment its true. National Small Business Week--even if you are a small business--provides an excellent platform for you to reach out to small businesses you DON’T do business with and make a sale. The National Small Business Week starts on May 5th and lasts until the 11th. Here are some ideas on how to make the most out of that week. Make a highly visible eﬀort, give back to your community by shopping at stores talking to the owners and employees. Then post supportive and true reviews while co-authoring with other small business on social media to promote your best side. You can add to the branding by employing a meaningful promotion related to your company. And we mean totally related. We want your message to be communicated not only by the wearer of your logo but also by your choice of product. Start promoting your business by networking with other business owners. Attend local events and always have a really cool promotional product to hand out. Use this time to build community and expand your visibility by teaming up with other non-competiting businesses to create an event where hundreds of your customers will attend. k is a time to gain big business. Let’s face it, the business card you exchange at these meetings will never have the same impact as a cool promo item with your logo on it. Start promoting your business by networking with other business owners. Attend local events and always have a really cool promotional product to hand out. Let’s face it, the business card you exchange at these meetings will never have the same impact as a cool promo item with your logo on it. Prepare coupons that are given out “with purchase” this week that have a time expiration date. When you are giving these coupons out, make sure your staﬀ knows to tell your customers there’s an expiration date and when they return to make another purchase they will get “a promotional products item as well”. Last, since you’ve only got one week to run this promotion, why not do one each day? You can simultaneously run an in-house edition for employees. By involving your employees you are making them be a valued part of the promotion. Their pride levels and enthusiasm in working National Small Business Week could enable you to gain big business. have many answers for doing just that. Here’s why its so important: According to Forbes a FIVE percent increase in customer retention can increase proﬁtability by up to 75% by using post-purchase email campaigns. email list broker. DO really comb through your email list, more than once...in other words, clean it. Quality--not quantity--in your email marketing campaign is critical. If your email list is targeted your email campaign will reach your true buyer and not random people that won’t use what you’re selling. You’re doing your best to avoid any people that just want the promo product and won’t transition to becoming a customer. Don’t worry, even the ones that won’t convert will wear your logo getting you impressions. However, the that people buy from you will really wear it, personally endorse it, and get you many more impressions. Best part is the real buyer becomes a Customer-Stakeholder in your company. Once they have become Stakeholders you are on the road to having those return and repeat customers you worked hard to get. Stakeholders support the company because they feel connected and a part of it. Remember that FIVE percent we mentioned earlier? Its attainable when you employ promotional products as part of your email campaigns. People will respond more frequently when there is a promotional product in exchange for participating in a two-way conversation via email. What you want to do is get your potential customer to ﬁll out their contact information on an automatic return email and then get their reward--your promotional product. But don’t make it too hard or too easy. Capture the prospects information...that’s the goal and will increase your sales. Showcase various ﬁnancing options during a week-long celebration of $1 billion in loans. During this week-long celebration the they handed out promotional products that embodied all of their various loan types. For motocycle insurance custom motorcycle stress relievers were used. For car loans the provided visor holders. Home equity loans were presented with multi-tool keychains & signature loans with Post-It pens. Provide a unique solution that gives Lenders, Credit Unions & Bank customers visual insight into all ﬁnancing options they have to oﬀer. Case Study Let’s Have Some Fun with This... (If you’re too serious, don’t read on.) Politics--it seems--is been blown out of proportion at almost every level. We’d like to share one that’s related to the promotional products industry. It’s pretty explosive so we hope that you think this is funny...even when it seems that’s impossible because of the political climate and how polarized things are. What are we about to report? There’s a new line of Michael Cohen promotional products. WOW. Chuckling a little, why should we be surprised? Promo products do a great job advertising whether you’re the President’s ex-ﬁxer or not. So moving forward from this point we’re sure you’ve guessed there’s a ton of Michael Cohen merchandise ranging from mugs to t-shirts that is hitting the streets. The one we laughed about the most was “MAGA--My Attorney Got Arrested”. Now we know there are die hards on each side of the political landscape, but we’d like to suggest just for this moment to laugh like we did. Showcase company by creating a technological promo item that will be used on a daily basis. A law ﬁrm was looking for a speciﬁc promotional product that their employees could take to the District Attorney’s or US Attorney’s oﬃce in order to obtain discovery documents and pictures to use in their cases. A key tag with a USB drive on it would enable documents to be downloaded into a super convenient traveling container. The results were past what was initially thought...after a short time people started Jones & e i l s asking for the keyring e L w s at La y e n r o USB drives and over a Att -2400 period of time thousands 954-210 were given out with the law ﬁrm’s name, web and phone number. Hundreds of people in the courthouse were using them...ample advertising reward for the small amount of money the law ﬁrm spent. The USB drive created 1,000’s of impressions...and did just what it was supposed to do. March 18, 2018 Trump issu starting the ball rolling for against a long list of produ China. This includes much Chinese theft of American and any company importin gests that this will hurt the along with other compani steel. Right after Trump was elected he and President Jinping of China were getting along famously. However, as time went by their relationship soured on trade. When Trump couldn’t get Jinping to agree on eliminating theft of industrial secrets by China from American companies, the talks fell off... and when Jinping wouldn’t budge on other trade issues that’s when the first $200 million in tariffs was enacted. The tariff’s have caused a slight uptick in base pricing for the promotional products industry on some imported goods. The latest update is there’s still no deal and quite a few layers of additional tariffs have been piled on top of the original $200 million. Trump and Jinping have relegated this to their staff to work out a compromised and the good news is new tariffs are on hold until both sides come up with a deal. Its not over yet. There will be quite a few handshakes before a new deal is reached and the tariffs re·scinded. Don’t expect any big changes anytime soon.